25.10.18 Lviv in the framework of the exhibition “Dental-Ukraine 2018” and the Dental Forum will be held a seminar. | Uimpl. Dental implants, implantation rates. HomeBlogDevelopments25.10.18 Lviv in the framework of the exhibition “Dental-Ukraine 2018” and the Dental Forum will be held a seminar. 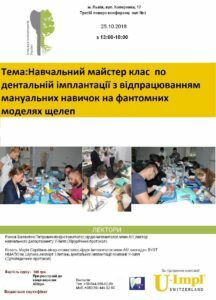 25.10.18 Lviv in the framework of the exhibition “Dental-Ukraine 2018” and the Dental Forum will be held a seminar.